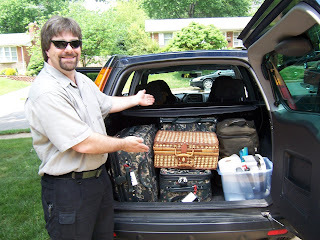 It was a late start, but John and I finally got the car packed and got on the road about 1 PM Monday, some deli sandwiches in the cooler for a late lunch and our new Garmin nRoute GPS system installed in the laptop – which was, naturally, on my lap. I feel like I’ve been prepping for this trip for months (and actually, I have been – I started making reservations back in April). We are headed to the Oregon coastline by way of the Badlands, the Black Hills, Devil’s Tower, the Grand Tetons, Yellowstone and whatever else strikes our fancy along the way. John and I have never made a trip this long before, so we have probably either over or under-packed – time alone will tell. Monday was pedal-to-the-metal time – we were trying to make the west side of Indianapolis before stopping for the night. We ran into countless rain squalls on the way, some of them quite strong. Fortunately the nRoute system was working well, although I quickly got tired of calling it “the program.” Since it has a pleasant feminine voice, I jokingly referred to it as “Betty” and the name stuck – John will ask me to “ask Betty what we do next” or “ask Betty how much longer we have to go.” We finally got to our hotel about 11 PM and pretty much went straight to bed, although I had trouble falling asleep and was awake by 6:30. 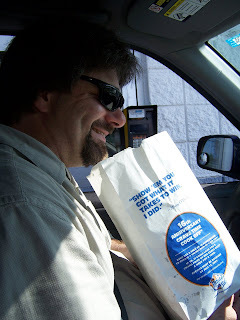 We were on the road shortly before ten, with a stop at a nearby White Castle for a bag of Slyders. Since we’re in the Midwest, the home of White Castle, he felt it was obligatory to do so. It made for an interesting breakfast, particularly since it’s the first “restaurant” food we’ve bought on the trip thus far. We’re trying to save a little money (not to mention time) by stowing sandwiches and other foodstuffs in our cooler, to eat on the road. Yesterday we drove through Maryland, Pennsylvania, West Virginia and Indiana. Today we continued through Indiana, Illinois, Iowa and South Dakota. We got into Vermillion, SD at about 8 PM, a sleepy little town which is sleepier than usual as it’s the home of the University of South Dakota and school is out right now. I made dinner courtesy of my George Foreman grill, a procedure which I’m fairly certain would be frowned on by hotel management, but it was good to have some hot food. As a treat, I made us some after-dinner cocktails. 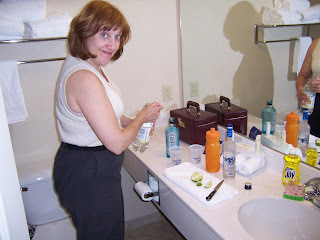 This is me in the bathroom, which served as the kitchen and bar for the evening. I made John a gin and tonic and me a Sea Breeze, and we’re now struggling to stay awake until The Sopranos comes on (which I fear will be at midnight). At least we don’t have so far to travel tomorrow – which is the first day in which we’ll actually be seeing some sights, rather than just putting miles behind us.